Consolidate your paper forms into Fieldwire’s easy-to-use construction forms app. Get all the benefits of our transparent tracking of who did what, when, and why. Use six standard forms or build fully customized forms to match your workflows and processes. Get rid of your paper and PDFs; fill out your forms from any device. Automatically maintain a database of all completed forms. 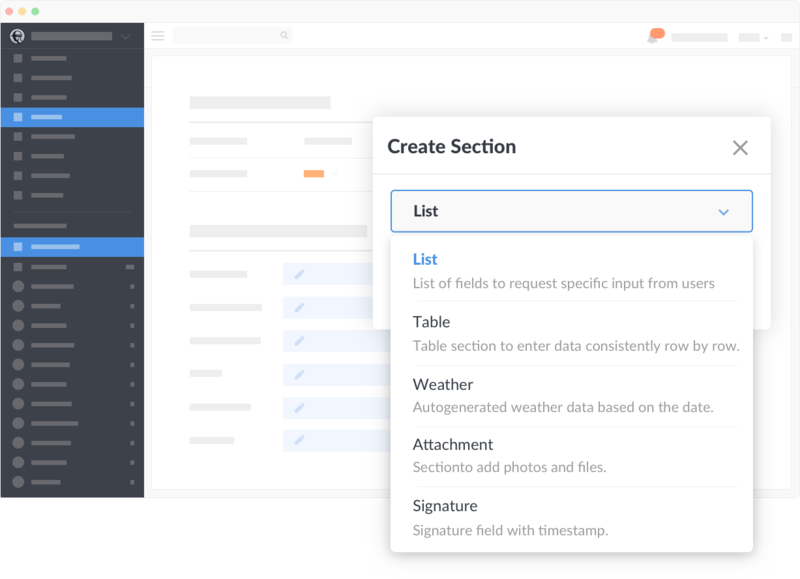 Build custom forms with the exact information you need. Fieldwire has multiple construction forms available for you to get started right away, but you can also customize your forms to exactly match any existing workflow or process with out form builder. Just start with one of our six forms — daily reports, safety audit forms, QA/QC inspection checklists, request for information (RFI) forms, timesheet forms, and time and materials (T&M) forms — and make modifications to require the fields you need. Alternatively, use our custom construction form builder software to create a new jobsite form from scratch. Use Fieldwire’s contractor forms for daily reports to streamline your dailys or field logs. No more having everyone either fill out paper forms that sit around collecting dust or manually typing daily reporting answers into a PDF when back in the office at the end of the day. Instead, Fieldwire’s free mobile forms app let any superintendent or foreperson in the field record dailys of what happened on the job site, including the weather, delays, accidents, injuries, and notes directly from their phone or tablet. Safety audit forms are a tedious, but necessary way to make sure everyone stays safe on the jobsite. With Fieldwire, safety forms are not only easier to complete but are time-stamped and cataloged in one central location, making the project data easily searchable if compliance issues ever occur. Keeping accurate safety documentation not only helps protect contractors from potential litigation, but also improves jobsite safety by identifying hazards and reducing risk before work even begins. Inspection checklist forms enable a contractor to manage inspections with a third-party inspector, such as a building inspector, fire marshal, or an owner’s representative. With Fieldwire’s inspection checklists, you can quickly specify the location on a plan of work completed and exactly what was done so that the inspection form is directly tied to a time, location on the blueprints, and specific piece of work. Request for information forms, also known as RFI forms, let all of the specialty contractors, architects, and owners involved in a project or jobsite collaborate in one platform so that no information is lost. With traditional RFI construction forms, there’s a gap between the people in the field who need to know what work to perform and the people in the office directly receiving the information. In Fieldwire, the field can ask questions in an RFI form and get answers directly. Everyone on the construction site needs to have a completed timesheet in order to get paid. With Fieldwire’s timesheet forms, filling out time cards for the payroll process becomes more streamlined when you only need to select how many hours each person worked, add any comments, and hit submit! This ensures your timesheets get logged in a timely manner, paychecks get cut accurately, and payroll just works. Time and materials forms, also known as T&M forms, help everyone on a jobsite report how long construction took compared to the construction schedule and what materials were consumed. This is required for any construction project that bills on a time and materials basis instead of a fixed price basis. With Fieldwire construction forms, the foreperson or superintendent in the field can notate what the T&M was directly, instead of waiting to fill out the paperwork back in the office.